Cead mile failte(100,000 welcomes) from Brendan Flynn, Proprietor/Owner. Welcome to Ireland, welcome to Dublin and welcome to The Church. I am delighted that you have found us and I do hope that you will now come to visit us in person to allow us to treat you to some wonderful traditional Irish hospitality. From 2007 I have been so fortunate to lead a great team of Irish and international professionals in providing a great Dublin experience here in this magnificent setting. We are constantly working with many great Irish producers of food and drinks to bring you, our guest, a special experience of Dublin hospitality. We at The Church are a family owned and family run traditional Irish business with over 30 years’ experience of looking after guests. And although we cater for a huge number of Irish and international guests each year we are very proud that we have a great team of Irish-trained staff in place to make everyone feel very welcome and special. While you are visiting with us please allow us to not only assist you in choosing your coffee, food and drinks but let us also inform you of all the great things to do and see in the local area and in this great city. Looking forward to welcoming you in person, Brendan. St. Mary’s closed in 1964 and lay derelict for a number of years until it was purchased by John Keating in 1997. Following extensive restoration over a seven year period, this List 1 building finally re-opened its doors in December 2005 as John M. Keating’s Bar. 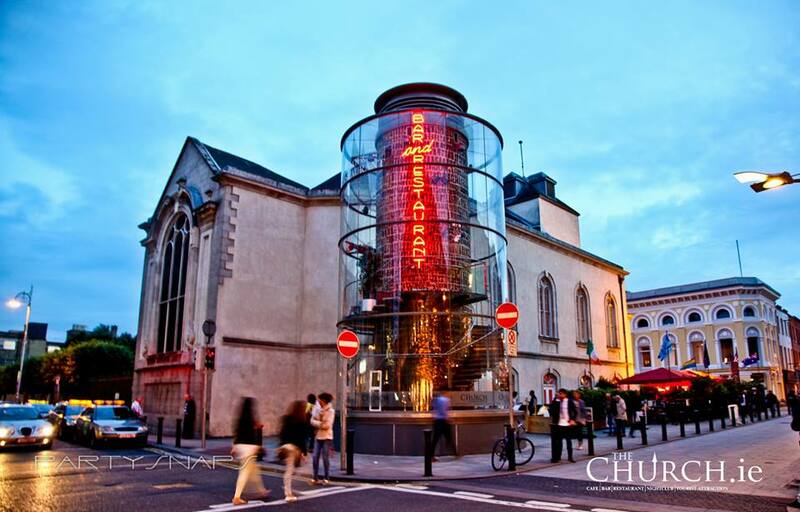 The tasteful conversion and refurbishment of this Dublin landmark was acknowledged at the Dublin City Neighbourhood Awards 2006, where it won first prize in the category of Best Old Building In September 2007 the building was acquired by new owners and renamed “The Church Bar & Restaurant” and its range of services was expanded to include a Café, Night Club and a Barbeque area on the terrace.